What you care about, matters to us. 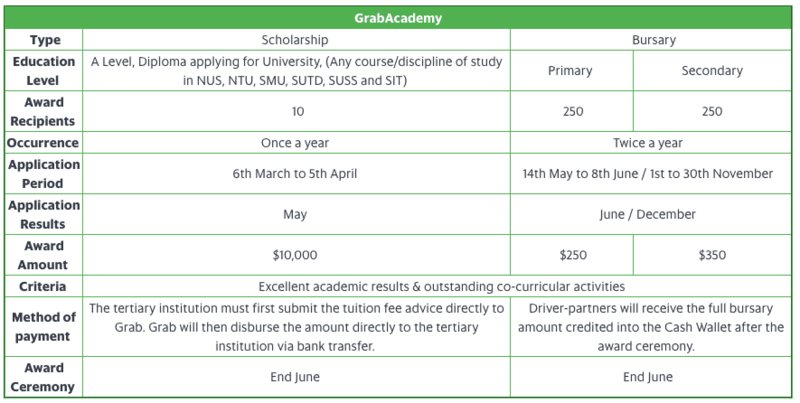 As part of our Better Everyday initiative, GrabAcademy extends its arm out to our driver-partners’ family through scholarship grants and bursary awards. Starting 2018, 500* Grab Bursaries for local primary/secondary schools (up to $350 each) will be awarded each year. No bonds included! Keep a lookout, Applications will be opening soon! Active on Grab Platform for at least 12 months upon application. Opened to Singaporean students who are in the top 25% of their cohort each semester. Each driver-partner can claim a maximum of $500 (for primary) and $700 (for secondary) per year.